I have been getting into body products more and more at this time. Maklumlah nak jadi bi.. orang. Haha. So I glad that I get to try my very own local home-made natural goodness products. It's great to know that people already start to make home made stuff which I find really awesome and innovative. Home made body products have been around in the US since before we knew it. As for we here, we are more to herbal type of body care. 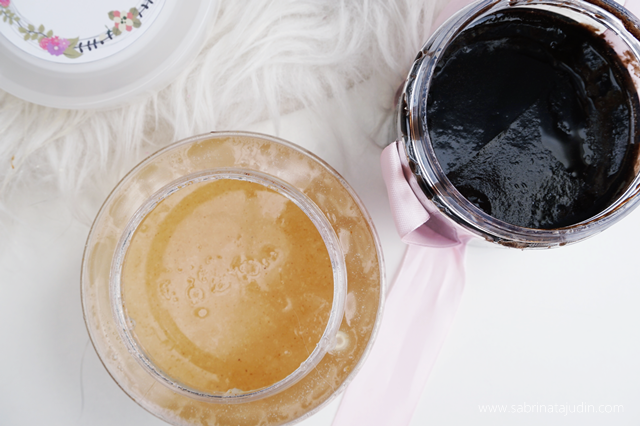 By just a few simple natural ingredient, we can actually make our own body care. But I got no time for that. I would just love to have it ready! Hehe. So I got to discover a brand called Homemade by Yayah. 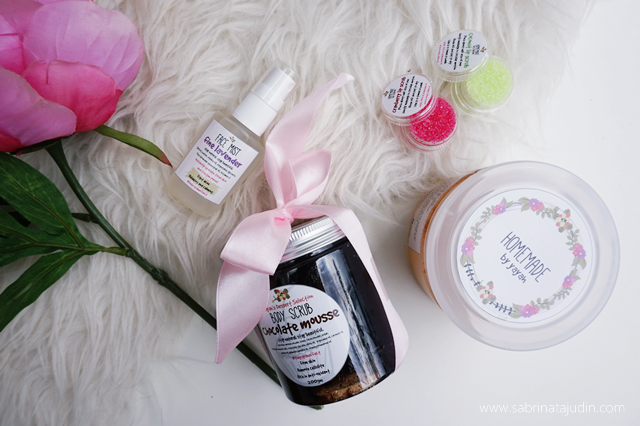 Homemade by Yayah carries products such as Body Scrub, Lip Scrub & Face Mist. It is home made and rich in natural goodness. I love how cute their packaging is! They all comes in a plastic packaging with stickers on it. Oh not to mention, these were sent to me in a cute gold box. Talk about shipping presentation. Kudos for that! I am going to let you know my thoughts on each products that I got. Fine Lavender Face Mist. This natural face mist is made out of spring water and other essentials such as jojoba oil and of course, lavender essence. I reallllyyy loveeee the scent of this face mist. It's really calming and soothing. It can be use as a toner or a quite face refreshing spray. 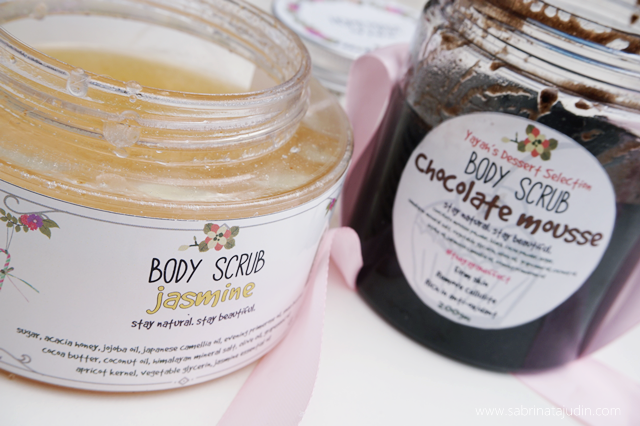 Jasmine Body Scrub. Who does not love body scrub. This body scrub has a jasmine scent to it. More to a flowery kinda scent. They also have in other scent such as Orange, fine lavender and many more. The sugar inside this body scrub is not too fine or too rough. Just perfect for scrubbing. It is a bit oily, but as you rinse it off it will leave your skin really moisturize. The essential contains in this body scrub also helps to improve skin elasticity and provides you with a relaxation sensation of the scent itself. 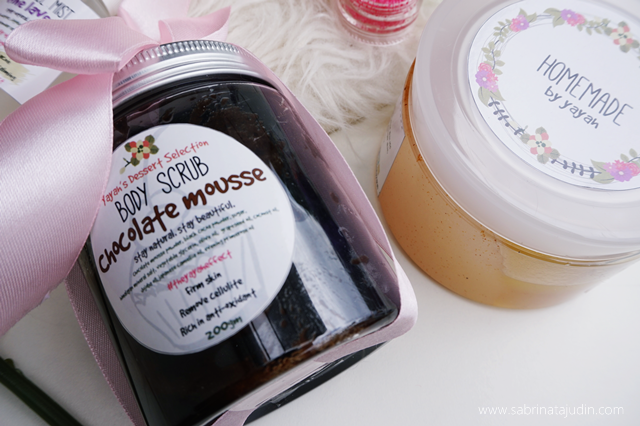 Chocolate Mousse Body Scrub. Not really a fan of chocolate but this one does smells really good. Chocolate helps to removes cellulite, firm the skin and provides you with high anti oxidants benefits. This is much finer than the body scrub above. I love to your it around my bottom. Haha. Just to firm it up. 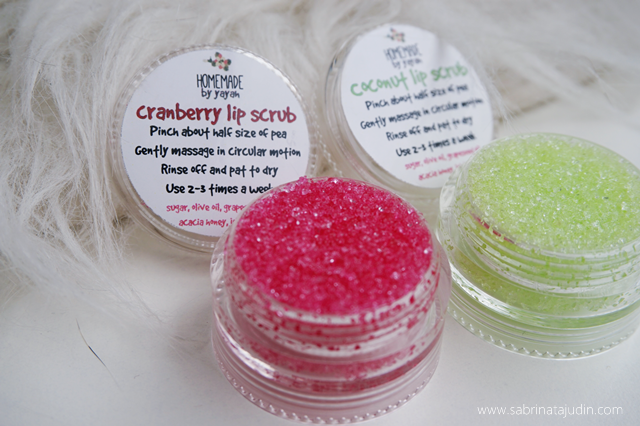 Cranberry Lip Scrub. I wish I can eat it. It smells so good and it taste so c=good! Its edible tho! Haha. This lip scrub is great on exfoliating my chapped lips. Pretty good in performance. I really love the cranberry scent. It also leaves my lip a little bit hint of natural red. Coconut Lip Scrub. Not a fan of coconut scent but this is pretty good! No worries, you wont get green stain on your lips. This has a sweet scent and taste too it. Performance wise just like the cranberry lip scrub. Recommended to be use all products within 3 month or so! The jar it self id good enough during that duration. Do check out Homemade by Yayah products! She is expanding her business to more and more natural goodness products. All links are listed below! Do you love natural products? Wah! Dah nak jadi bi** org.. Congratsss hihii. It's good to treat our own body, bukan luaran je,dalam pun akan rasa lebih peaceful..
haha in shaa Allah.. yep! especially body care, a good way of pampering self! hehehe... aah, bau pun sama! ada lagi ke product ni? try buka fb, ig tak dapat pun..
Ada lagi ke product ni? Try cari di internet semua page yang ada tak available.